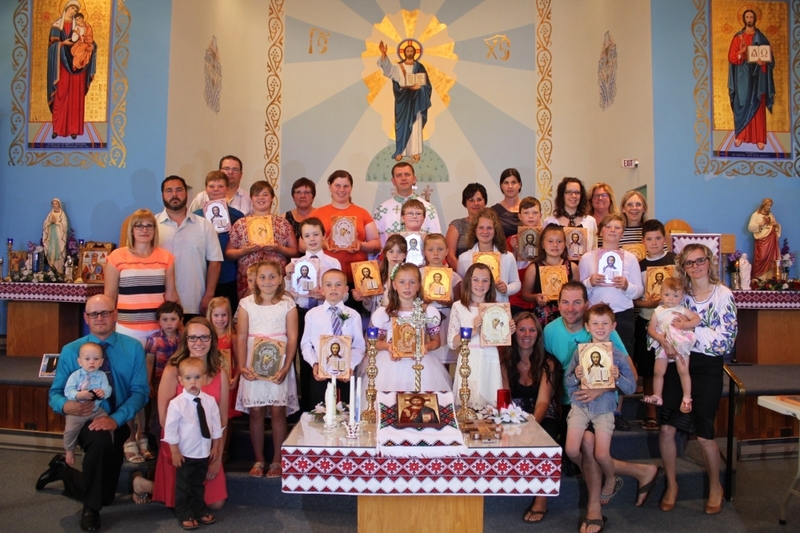 The Sacred Heart Ukrainian Catholic Church in Rossburn, Manitoba held its annual summer catechism this year from July 1 – 8, 2017. Under the spiritual care of the local priest, Fr. Mykhaylo, Dobrodiyka Iryna Khomitska, and 11 volunteer parents and teachers, a total of 45 children ranging in age from 3 – 15 years from Rossburn and surrounding areas gathered this week to learn about Jesus. The days would start with Divine Liturgy and prayer with a short homily to help the children better understand the word of God, and explanation of the preparations for First Holy Communicants. After liturgy, everyone would go outside for some “wake-up” exercises. Father Mykhaylo would perform a variety of meaningful magic tricks that related to our lives. A healthy snack would follow. The children would then break up into age appropriate groups and begin with catechism lessons followed by bible stories, songs, crafts, dancing, games and outdoor activities A delicious (and very much appreciated) BBQ lunch was served twice during the week. The days were very busy so we were thankful to have seminarian Alex Pankiw as well as Father Yaroslav Buduykevych and his family help in any area needed during the day. The children especially enjoyed making the crafts this year which included making “Jesus” t-shirts and gluing Jesus or Mother Mary icons, onto a plaque and then personalizing it. They were then blessed by Fathers Mykhaylo any Yaroslav. The children were captivated Thursday afternoon as Fathers Mykhaylo and Yaroslav came outside with a larger than life rosary made with helium filled balloons. After everyone prayed the rosary, as it floated over the children, it was let go. The end of the week was finished by Fathers Darren Kawiuk and Mykhaylo listening to the children’s confessions and getting the first communicants ready for the next day. A beautiful Divine Liturgy, held on July 8 by Father Mykhaylo and Father Yaroslav Strukhlyak, celebrated the 1st Holy Communion for 4 children. Congratulations to those who received the Holy Eucharist for the first time. May God bless you and keep you in his loving care. The Divine Liturgy was followed by fellowship and a beautiful meal and cake provided by the UCWL at the church hall. A sincere thank you to Father Mykhaylo, and Dobrodiyka Iryna for their enthusiasm, guidance and constant faithful service to local and surrounding parishes, communities, and families. Your example of devotion and dedication to God is inspiring. Thank you for the volunteers and teachers who helped make this week run smoothly. Sincerest gratitude also goes to the Knights of Columbus who provided the t-shirts, icons, plaques and all other crafting materials. Thank you to the parish for organizing snacks and lunches and UCWL and Sisterhood for the delicious lunch and cake on Saturday. Thank you also to all donors and families for any contributions to make this catechism possible for the children Most of all, thank you to the children who came out to participate in catechism to learn about the love of God and to the families who supported them. We look forward to next year and seeing everyone again. May God Bless you all!! !